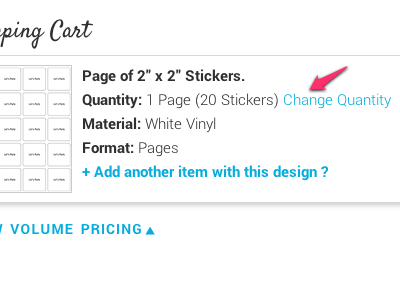 Quick tip: After adding your stickers to your cart, you can change your order quantity in the checkout. You’ve created your stickers, and are ready to order - but you don’t see your sticker quantity! No problem. We wanted to give you a quick reference to sticker quantity and pricing, and that meant leaving some quantities out. Maybe you noticed that the options available jumped from 10 sheets to 15... But you want 12! You can always adjust your page quantity in the checkout, after adding your stickers to your cart.